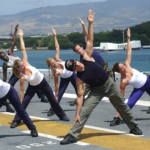 Aerobic activities are very important for our overall health and wellbeing especially for the health of your heart. They are continuous activities that use a whole range of muscles (e.g. walking, cycling and dancing). In addition to aerobic activity, it is also important to participate in some activity a couple of times a week which improves your muscular strength, stamina and flexibility. 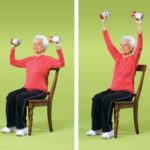 These activities will help build up your stamina, improve the shape of your body and muscles, make your bones and muscles stronger and prevent injury. Climbing, circuit training and gymnastics are examples of sports that are good for muscular strength and stamina. Flexibility or the range of movement around joints can be improved by doing flexibility exercises such as Yoga, Pilates or Tai Chi about twice a week. Flexibility is important for preventing muscles becoming sore and injured, helping you carry out everyday activities more easily and for improving posture.